Cannonballer’s note: Somehow I managed to screw up posting this review. I even linked to a non-existent post from the main cannonball site. Oops! Here it is, helplessly out of order. There’s a problem with putting off these reviews too long, particularly when they are the romance novels of a certain author that you only allow yourself as the fluffy brain cleansers between heavy works of fiction. You forget the details. All of the details. And then how do you review something that is out of the memory loops and which you have already returned to the library? Particularly when you’ve also let yourself get sucked into the next two books in the series and haven’t written those reviews yet either. You do your darndest, that’s what you do. So the fact that I finished Nora Roberts’ Bed of Roses within hours of finishing Ready Player One and then put the review off until I could get my brain around how to review Cline’s work has proven dumb. (I just didn’t want to post two romance novel reviews back to back). There is nothing wrong with Bed of Roses other than its boring title which is probably shared with a dozen other books (and a movie, and a television show in Australia). This one picks up where Vision in White left off, but in fine Roberts’ format we’ve moved on to another friend in the quartet – one Miss Emmaline, or Emma to her friends. Emma is the florist of the Vows bunch and is the one who has had the most ‘luck’ with men in the past. She has a constant stream of male admirers and when we catch up with her at the beginning of the book she is looking to have a quiet night on her own. She is also a teensy bit jealous of her friend Mac’s budding relationship with Carter and wants what they have. Emma is a great protagonist. She is innately self-aware if somewhat over emotional and Roberts’ really seems at home with this character. I’m an Emma fan through all of the books. Her counterpart – Jack, architect and best friend of one Delaney Brown the brother of Emma’s partner Parker and Emma’s surrogate big brother – is a likeable character as well, but there are some faults in there so that they can have a big ol’ fight right around page 300. The first time I read Northanger Abbey, I was disappointed. I thought the romance was rather cobbled together, and Catherine Morland seemed the most dimwitted of all of Austen’s heroines. It improved upon the second reading, though. I think my problem with my first read was that I was expecting it to focus too much on the romance. But upon reading it a second time, I realized that the strength of this book is its emphasis on friendship, especially in regard to avoiding bad ones. 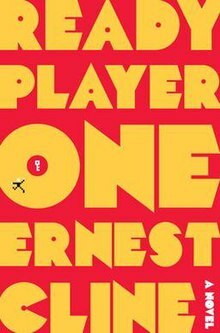 When I first started reading Ready Player One I was afraid I was only going to like it because of the hype. I am pleased to report that this was not the case. If you’ve read anything or heard anything about this story you’re aware that it is a love letter to growing up in the 1980s. It’s also a confession of a love of all things gaming. However this is not a book which aims to exclude. It is a book which aims to include the relatively uninitiated (while also being a homage for those who are in the know). My non-gamer heart feels gratitude for that. I am also thankful that the cover art is very vague which kept my brain from trying to figure out the puzzle ahead of time.